It's no secret that I spend some of my time talking about how to promote cycling positively and built into that is, of course, the discussion of helmets. Those of you who have read this blog for a while are well versed in my opinions. And it's times like this I happily link to the first TED talk I've done. One of the points of in the discussion is risk compensation. The idea that if we have this perception of protection we become less risk adverse and push ourselves a little bit harder. It's a tough nut to crack. I've had discussions with intelligent friends were I've highlighted how most head injuries happen inside of cars - even with airbags and seat belts. I explain how an Australian government study suggested that motorists be made to wear head protection and I happily find photos of the motorist helmet developed by the University of Adelaide and Monash University on my smartphone to show them. More often than not, the people I speak with or interested and inquisitive which leads to an interesting discussion. There are those, however, who leave the rationality at the door and wax on about their airbags in their fancy new car. Pulling all of their faith in their survival as Homo sapiens in these devices. Regarding risk compensation and cycling, it is said that if cyclists put a helmet on, they will be given a false sense of security and the result will be that they ride a bit faster and perhaps a bit wilder. Cycling past the limits of their abilities without really realising it. It is the subject of a great deal of research done by people with greater expertise than I but I find it fascinating. Last year, in 2012, I decided to embark on a little experiment of my own. A little bit of documentation and research. The numbers of people wearing helmets in Copenhagen has increased, not least since 2008 when the Danish Road Safety Council - the nation's greatest unofficial automobile lobby organisation - decided to go all out with an emotional propaganda campaign unleashed on an unsuspecting population - in one of the safest countries for cycling in the world. They obviously haven't read Frank Furedi's book Culture of Fear. What we see is a lot of people who have been riding bicycles in Danish cities their entire lives now wearing helmets. By and large, these are the same citizen cyclists as ever, they are just wearing plastic hats. According to our research at Copenhagenize Design Company 17% wear helmets. I was curious to see if I could register a difference in behaviour between those who are wearing helmets and those who are not on my daily cycling trips around the city. I have spent the last 18 months quietly and patiently counting. If you know anything about me you know that I am not a rock 'n' roll speed demon on my bicycle in Copenhagen. I do, apparently, tend to cycle a little bit faster than average. I can see through the journeys that I have tracked through the Endomondo app ("cycling as transport" is an option, which is why I use it) that my average speed is a bit over 20 km/h. The average speed for cyclists in Copenhagen is 16 km/h. I've noticed for years that I overtake other bicycle users much more often than I am overtaken. I also noticed that since more and more people are wearing helmets in Copenhagen, the people that generally overtake me are wearing them. Indeed, a vast majority. I decided to to document the numbers with some private research. Counting how many people are wearing plastic hats among those who overtake me on the cycle tracks of the city. Let it be said that I haven't cycled dozens and dozens of kilometres every single day, clicking a little counter religiously. I just started counting how many people were overtaking me and how many people or helmets and I wrote down the results everytime I got home. The nature of my journeys around the city vary greatly, so some days only a couple of bicycle users were counted and other days there were many more. If I rode down one of the many busy bicycle routes during rush hour each and every day, it probably wouldn't have taken so long. The data would have been different though. Copenhagenize Design Company noticed in our Choreography of an Urban Intersection study that there are more bicycle users wearing helmets during the rush-hour then there are during the rest of the day. Especially the morning rush-hour has a different tempo and intensity to it than cycling through the city in other periods, and even the afternoon rush hour. As a result, my private data gathering expedition had a broad spectrum of bicycle users involved. On the journeys where my speed was higher – late for something – or slower – riding with my kids or having a conversation with a friend – I didn't do any counts. I only counted when I was rolling along at my average speed, in the interest of consistency. I decided to set a ceiling at the beginning. A nice big number that would give me some credible and reliable data. I thought about 1000 but then decided to go for 3000. I was in no hurry. Finally, last week, I rounded 3000 bicycle users overtaking me and so it is time to share the results. If I average out the 3000 bicycle users who overtook me since June 2012, it works out to be 5.48 each day. 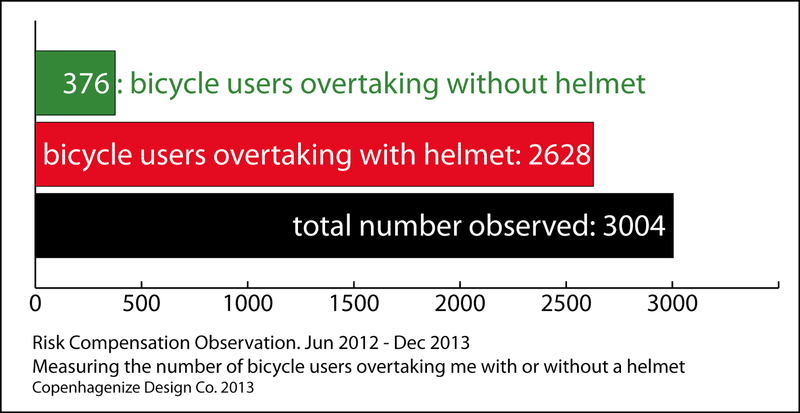 Basically, 12.5% were not wearing a helmet and 87.5% were wearing a helmet. You can decide yourself what you want to do with the results of this study. It does indicate that there is a clear difference in behaviour between the bicycle users in Copenhagen who wear a helmet and who do not. Also, considering the fact that a bicycle helmet is only designed to protect your head at speeds of 20 km/h or lower, these bicycle users were cycling at speeds that exceeded that. These are the hard numbers. I can add to this a general idea of my other observations over the past year and a half. For example, it was mostly men passing me by - but not such a high number as I anticipated when I started. I didn't record the exact numbers but my qualified guess is 70% male. I live on a main street leading to and from the city and I have noticed that most of the women who passed me did so in the late afternoon when they were heading home from work. The style of the bicycles also indicated to me that they were commuters were heading a bit farther than the majority in the city. So, yeah, they would tend to cycle a little bit faster than average. I have caught myself doing the same thing when cycling home from various jobs on similar routes in the past. Fair enough. It remains interesting though that was during this period that most women overtook me. As virtually every other bicycle user in Copenhagen will tell you, the high-speed overtaking serves little purpose in the densely populated neighbourhoods. As a rule you roll up beside them at a red light 200 m farther along. All that agressive bell ringing for nothing. This entire study was for my own personal edification. The data I gathered can perhaps be interesting to some others. Great if it can. I just noticed a pattern and I wanted to document it. Also because nobody has done it before and given the fact that helmets are a new thing in Copenhagen this is an interesting and unique location trying document such behaviour. It has been an interesting and fascinating task but to be honest I'm quite pleased that it is over and I can once again happily cycle through my city without having to do mental counts several times a day.